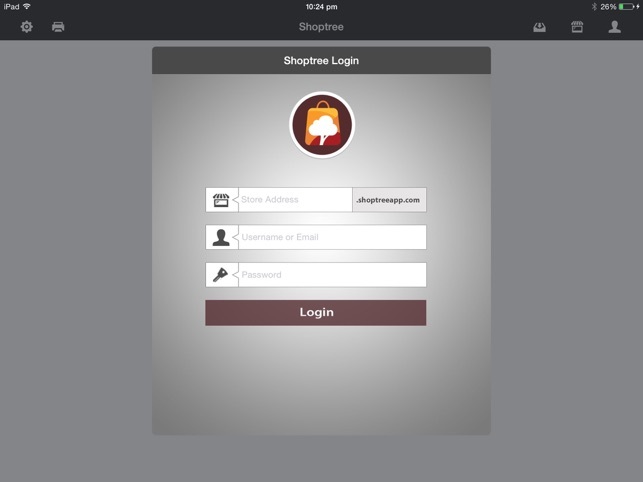 Shoptree is a easy to use cloud Point of Sale software system for sales, inventory and customer management. - Works Online and Offline. - Receipt Printer Support for Star TSP 143, Epson TM-T70, TM-T81, TM-T82 II, TM-T88, 3rd party ESC/POS Printers with LAN or Wifi. Bluetooth mobile printers from StarMicronics & Epson are also supported. 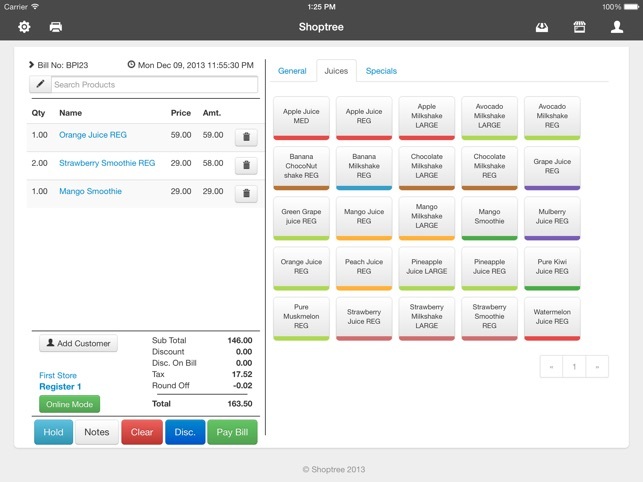 - Table Order System for fine-dine restaurants. - Custom Receipt Templates for Multiple Print locations like kitchen printing. - Open Cash Drawer's or trigger Buzzer's in kitchen printers. - Quickly add products to sale with Barcode Scanning support for Socket Mobile CHS 7Ci, 7Di, 7DiRx bluetooth scanners. 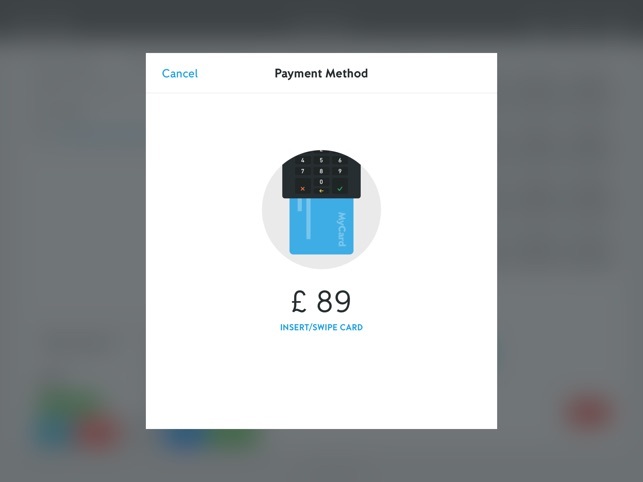 - Accepts Credit and Debit card payments from Shoptree Payments (India & Sri Lanka), iZettle (UK, Europe & Brazil) and CardFlight Reader (USA). - Adjust Quantities, Change Prices, Taxes & apply discounts to a line item OR to the complete sale. 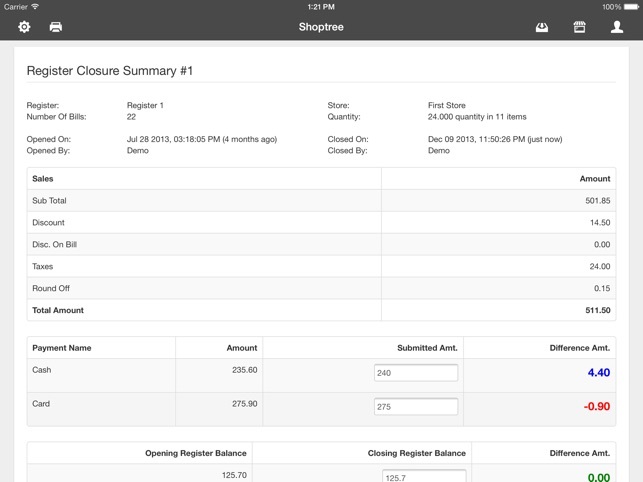 - Register Closure Summary Reports. - Print X & Z Reports quickly. Also print a wide-range of reports with custom filters from backend. - View reports, add products, manage stocks and pricebooks in real-time across all your stores. 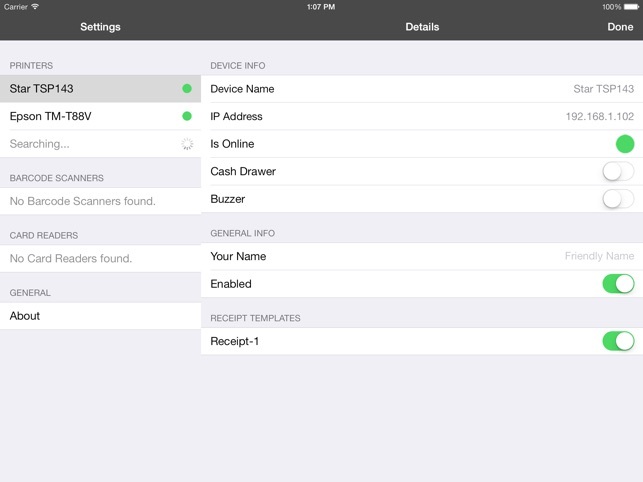 - Settings page for easier management of connected Printers, Barcode Readers and Credit/Debit Card Readers. If you have any questions and feedback, you can always reach us via phone, email, Facebook and twitter.